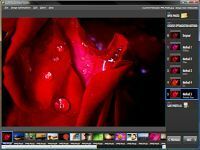 Are you looking for free photo editing tool to enhance your favorite photo? PhotoPerfect Express may be your solution. PhotoPerfect Express is a professional quality, free and easy to use program for optimizing your photo to greatest potential. The PhotoPerfect Express enable you to enhance your favorite photo in three simple steps which are open photo, choose your favorite optimization and save photo. Image enhancement with just 3 simple steps. Stunning results without any technical knowledge. Five powerful image optimization methods. Expandable functionality through -in-depth fine tuning and fully automated batch processing with superior results. It is a freeware and available for .